Blackjack can seem like an extremely complicated game to the outsider. In truth, it is actually a fairly simple game but with a lot of extra complexities for the masters, but it remains quite forbidding and imposing for those who may only know the game from various movies. 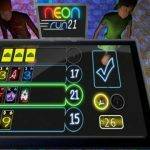 Neon Run21 hopes to open the door to new players by offering a game that is a simplified version of Blackjack. The board is laid out really nicely, and it is extremely easy to see your score for each row, and how far you are from that magic ’21’. 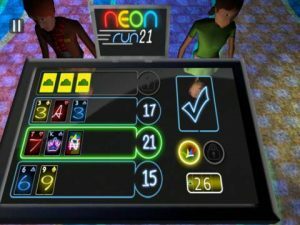 The ‘Neon’ part of the title extends to the actual game, and everything is presented in an attractive neon sheen that does make the game stand out. The game is in 3D, so all the cards move and spin around as you play them, and there are no graphical glitches or problems that I could detect. The only issue with the graphics are that some of the 3D characters look a bit wonky and lack character. 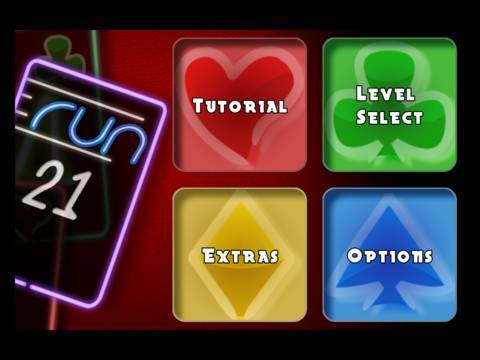 “Neon Run21” is a custom variant of blackjack designed for a touchscreen, where you don’t need to know casino basics or count cards to begin playing. Neon Run21 is the first fully 3D card game for iOS. Our music is fully orchestrated from TV/Film musicians and our engine was created by an original member of Apple’s iPad 1 graphics team. 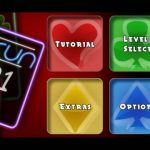 We are the only blackjack game appropriate for all ages and are rated 4+ as we do not feature any form of simulated gambling. * Each game session takes between two to three minutes, enough for a coffee break! 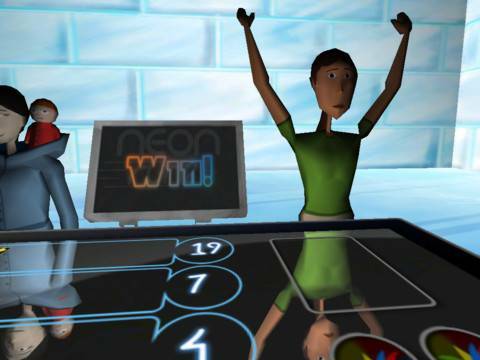 * Proprietary 3D Engine with “Game Show Text” and 3D Dealers. 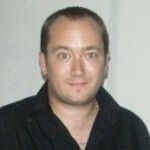 * UI system designed for iOS with giant easy to use buttons, no timed events, and no in-app purchases or advertisements! * 10 Levels, 8 Dealers, 3 Environments, and 5 fully orchestrated musical tracks. The game comes with a really good tutorial that will have you up and playing properly in no time at all, a series of computer opponents to play against and an ‘extras’ screen that only contains a link to the developer’s Website at the moment. 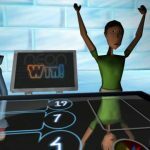 The developer tells me that Game Center leaderboards and achievements are coming, along with a new gameplay mode, which is a good thing as the game is crying out for more content. A major thing missing here is any kind of multiplayer. Even pass and play multiplayer with one device would be great, but as it is the lack of content is critical here. There may be more coming, but as it stands now, there simply isn’t enough here. One good aspect is that the game is at least universal and works fine on both iPhone and iPad. The lack of IAP’s is also most welcome. This is a very good Blackjack game, especially for beginners, and is attractive and very fun to play. The game desperately needs some extra content, however, as what is here just isn’t enough. When the update for Game Center integration rolls around, you can add five points to the mark below, and another ten for more single player modes and a multiplayer option. So, with those this game would score an impressive 85, but it is a testament to the inherent quality here that I still feel the game should still score pretty highly.